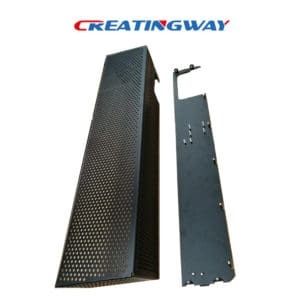 Creatingway is sharing more Sheet Metal Fabrication process skills with customers together in order improve and enhance our quality quality and process. Most of Sheet Metal Fabrication process have below procedures, so we have to know more details before development and manufacturing. Shear–Punch–NC blanking–Laser blanking–Sawing machine–Bench-Finishing process. The main process for Sheet Metal Fabrication Machining. Our current maximum facilities can help you to complete the products size: 80*80 inch, the material thickness from 0.02″ to 0.25″, and parts of tolerance under +/-0.004″. Aluminum, Copper, Stainless steel, Carbon steel, Brass etc from open marketing. If any special inquire, we can consult with you to find it, or you will be able to provide us, we always are flexible working to make your comfortable. drawing, required sheet metal thickness. 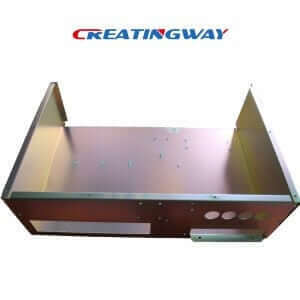 appearance, chromium plating without crease. Our fabrication engineer team always closed to work with you on any of your new projects for these products construction or production to provide you more valued proposals for review and and approval during development. If so, we always make sure each of steps with best to make your products better in cost and appearance. Welcome visit our website and email more information to share more tip of sheet metal fabrication together to improve our quality and services, contact us now. Yes, you can email on these issues, Thank you. Thanks for providing information about sheet metal fabrication, wherever you go for selecting material for welding and fabrication you must know about these topics which you mention in your blog. Thanks again for this great information. And if you have any inquire on these, then get us for working out, looking forward to work with you, Thank you. This sheet metal fabrication processes and procedures are a big help to those who wanted to try this kind of industry also. Of course, it’s not an easy work and they need all the knowledge they can get in order to be successful in it. thank you, welcome inquire us. yes, thank you, and if you have any inquire, then get us for working out, email us. yes, we can do gold plating, included metal fabrication, cnc machining parts. no problem, inquire us now. How to Save Cost for Your CNC Machining Projects?